Scott Geesey made a strong statement in Saturday night’s season opener at Susquehanna Speedway. After finishing in a tie with Russ Mitten for the 2016 track championship (Mitten was champ based on wins), Geesey drove through the field from his 15th starting spot to secure the opening night win in the 25-lap Credit Connection Auto Sales Super Sportsman feature. Aboard his Kreitzer Excavating, Crredit Connection Auto Sales, Silver Lake Inn, Rumbergers Automotive Service Center No. 41, the Wellsville driver worked his way past leader Paul Miller on the 19th lap and drove off for the feature win. Miller led first three laps of the feature before giving way to defending track champ Mitten, who led until lap 11 when Miller regained the top spot. Miller settled for the runner-up finish with Gregg Foster taking third, 19th starting and B-Main winner Scott Dellinger coming through for an impressive fourth with 12th starter Davey Walsh rounding out the top five. Rich Eichelberger was sixth trailed by Doug Dodson, Mike Enders, Tony Jackson and Kenny Edkin. Eichelberger, Frankie Herr and Devin Beidel were heat race winners for the 29 Super Sportsman. Dellinger was the B-Main winner. Herr was a flip victim late in the feature while Beidel saw his race car go up in flames early in the feature. Neither driver was injured. Randy Christine, Jr. took a big step in defending his 2016 track championship by wiring the field in the 25-lap Bernheisel Race Cars 358 Late Model feature. 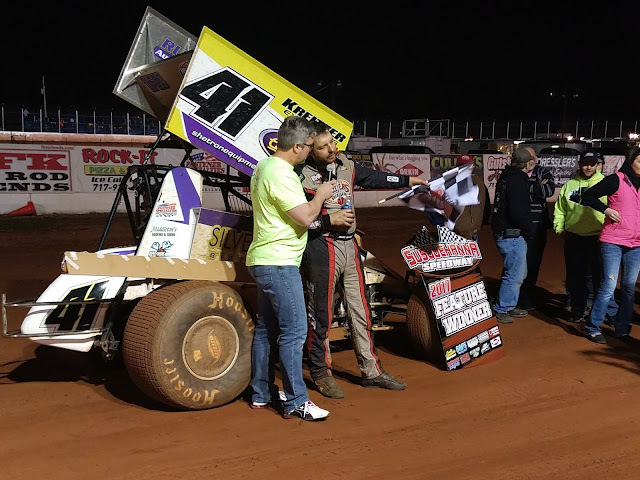 By virtue of drawing the pole for the feature, the Manchester driver was never seriously challenged in scoring the opening night win in his No. 74 machine. Brad Shank ran second the entire distance while Sean Merkel finished third over ninth starter Brian Shuey and Justin Ehrhart. Chase Billet came home sixth over 18th starter Randy Stroudt, 23rd starter and ArtWerks Hard Charger Cam Zeigler, Charles Potts and Matt Murphy. Shank, Ehrhart and Chase Billet for were heat winners for the 24-car field. Scott Houdeshell led all 20 laps to score the win in the ServiceMaster Clean Central PA Legends feature. Houdeshell withstood five cautions, including one with two laps remaining to secure the win over Travis Perry, Jeff Herbst, Mason Chaney and Lucas Montgomery with Bill Diehl, Bob Stough, Bob Scott, Jr., Justin Forbes and Tim O’Sheehan the top ten finishers. Harlon Leppo, Chaney and Stough were Legend heat winners. There were 24 cars pitside. The 20-lap Morgan Paving./Aqua Fun Pools Street Stock feature had all kinds of action at the front as defending champion Mike Potts led the first 11 laps before pitting with a flat tire. This turned the lead to Kevin Sigler but Sigler and two more frontrunners were involved in crashes before a lap could be complete. Eddie Richards, who started eighth assumed command of the feature and would score the win ahead of Potts, who drove back through the field. Jim Palm started 23rd and finished third earning the ArtWerks Hard Charger ahead of Ryan Smith and Matt Adams with Chad Stine, Doug Barber, Craig Morgan, Daren Rice and David Dietz completing the top ten finishers. Smith and Joey Hoffer won heats for the 24 Street Stocks. Susquehanna Speedway returns to action Saturday night, April 1 on Tyson Fence Night featuring the Credit Connection Auto Sales Super Sportsman, the Mason Dixon Shootout Series for the Bernheisel Race Cars 358 Late Models, the Morgan Paving/Aqua Fun Pools Street Stocks and the Superior Homes Extreme Stocks. Racing begins at 6PM. 1. 5- Scott Houdeshell 2. 19- Travis Perry, 3. 18H- Jeff Herbst, 4. 8CR- Mason Chaney, 5. 15- Lucas Montgomery, 6. 53- Bill Diehl, 7. 0- Bob Stough, 8. 47- Bob Scott Jr., 9. 69X- Justin Forbes, 10. 519- Tim Osheehan, 11. 9- Rick Hartwig, 12. M1- John Kooti, 13. 13R- Joe Radle, 14. 66- Trent Yoder, 15. 7MD- Nathan Renfro, 16. 2A- Ken Boyce, 17. 18S- Jorje Sweger, 18. 85- Chad Earnst, 19. 6- Todd Rahley, 20. 8- Robert Shaw, 21. 3AU- Hayden Pascoe, 22. 58Z- Zachary Settle, 23. 99- Wayne Welsh 24. 15H- Harlon Leppo. 1. FOUR- Eddie Richards, 2. M1- Mike Potts, 3. 7P- Jim Palm, 4. 59- Ryan Smith, 5. 9- Matt Adams, 6. 19- Chad Stine, 7. 63- Doug Barber, 8. 11- Craig Morgan, 9. 8- Daren Rice, 10. 71- David Dietz, 11. 88P- Brett Pickel, 12. 64- Brandon Wanner, 13. 12- Scott Thunberg, 14. 7S- Kevin Sigler, 15. 91- Dalton Frye, 16. 21- Joey Hoffer, 17. 54J- Jimmy Combs, 18. 0- Richie Dobson.